Collage Saint James is a retail store in Saint James, Minnesota that sells a variety of products including clothing, home décor, kitchen items, gifts, and much more. Karen Altenburg owns and manages the store. Collage Saint James has a huge customer base drawing locally as well as regionally. Collage Saint James is in the heart of downtown Saint James and in the hearts of all the residents. Located in the Opera House Building, it shares the location with Encore Café and Coffee Shop. Both businesses are loved by the town and have been a part of its history. Collage Saint James began 35 years ago and is well-established in Saint James. Recently, the previous owner, Jeanne Miest, decided to retire and sell the business. For Jeanne, Karen Altenburg was the obvious choice. Karen worked with Jeanne in the past year to learn more and prepare to take over. 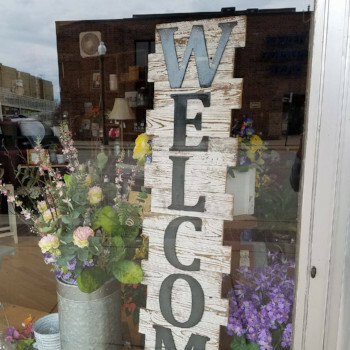 Through the Small Enterprise Loan Program, Southern Minnesota Initiative Foundation (SMIF) helped Karen keep the beloved business running and maintain its status within the community. Collage Saint James received the loan in partnership with Watonwan County Revolving Loan Fund administered by the Saint James Economic Development Authority. The loan allowed Karen to have a successful transition of ownership and also make some exciting new changes to Collage Saint James. Karen has rearranged and organized the store and added new technology to ease the purchasing process and keep the business growing. Customers rave about Collage Saint James on Facebook saying, “I love the look!”, “The store looks more open”, “It doesn’t feel so crowded and I found things easier”. With a five star rating, Karen Altenburg is clearly doing a fantastic job. When asked about working with SMIF, Karen stated, “It was great. There were absolutely no problems. The loan process was easier… SMIF has so much more to offer their clients.” Collage Saint James is thriving and with the help of this loan, will continue to do amazing things.